I have been away for what seems like a lifetime. The last two weeks have been a lesson in multitasking work and emotions. Hectic and relaxed at the same time. Happy and not so happy. Meeting and parting. Savoring some memories and mourning others. Before I get into details, a big thank you to everyone who sent in there congratulatory messages for the Telegraph and HT write ups, another big one for all your wishes for the Masterchef Auditions and last but not the least for all those emails asking me if I was planning to get back to blogging :) Your emails and messages always make my days brighter. So...my little sister conned me into going for the Masterchef auditions and I decided to give it my best to amuse her, my family and friends. Before I knew it, it all got way too serious and there I was at Mumbai as a part of the top 100 for another round of culling. Top 50 this time. Yes, I made it to top 50. Yay Yay. And got back home. It was an amazing experience. We talked about food, saw food, cooked food, read food. And then I withdrew my name from the contest. Yes, you heard it right. The time I was away was very hard for Sara and I was required to be there for 4 months this time. So like Sara puts it, Mumma birdie came back to Sara birdie. Now I am off to bake some cookies for the little one and see her smile. She tells me , Mama you are my Masterchef...aww! And on that note, lets get back to blogging. Btw, how many of you are watching the Masterchef Australia series? Sara and I are loving it. Well, It's great to know that you made it to the top 50. But life is all about choices you make, and you've made the right one! Well, I have been watching MC from day 1 (I love these cooking shows) and am totally hooked. Looking forward to watch the whole series even though I know the winner (was following FB updates on MC Australia) I know! But don't worry I won't give away any spoilers here. Looking forward to hear more from you on the Blogging world! Well! I Couldn't agree more with you ..and the quote which you posted is perfect:)..
Yay, congrats that is awesome!! Glad to have you back at blogland. Missed you!! hugs Anu! Good Good!!!! you are back. You have been missed. 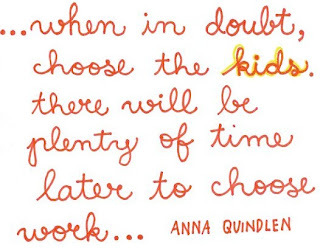 I love that quote - chose kids - very true :-). Yes.. its been a long time.. But yes.. 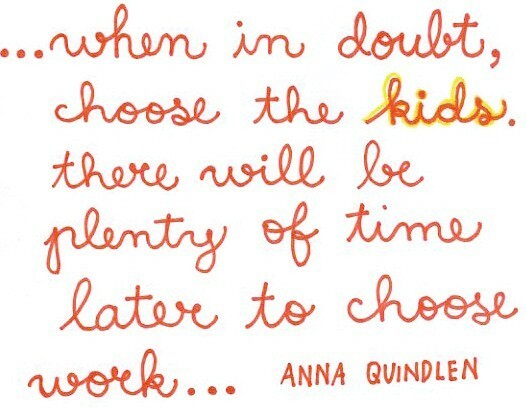 I totally agree.. kids over work... atleast over blog for sure!! :-) Come back soon Prachi! You've been missed!! You did the right thing! :) Hugs!! Oh yay! You are back too :)You were missed! Awwww.. Sara's words were so cute! Congratulations on Masterchef! Nice to get back all news from you.I really dont get time to read,blog and so much,coz of the little ones.its nice to knw that you got into the top 50.i thought yo would be busy there ,but you came back...yeah true what you said? ?